The Murder In The Afternoon book club will get a glimpse of current Detroit for our March discussion. Stephen Mack Jones got the attention of many with his debut, August Snow. The title character and his relationship to the city show great possibilities for a long-running series. 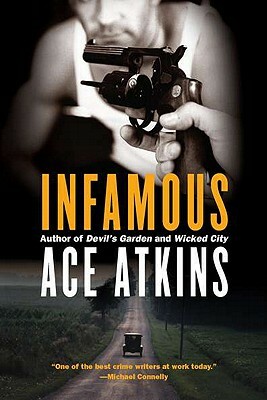 August is an ex cop returning to Detroit a few years after stirring things up. He won an eight million dollar lawsuit for being wrongfully fired after he blew the whistle on the mayor and some brothers in blue. He moved into his parents’ home in Mexican town, flipping other properties in the neighborhood as well as serving as its unofficial protector. When a finance magnate offers to hire him to look into questionable practices at her bank, he declines, but her suspicious “suicide” after draws him into a plot involving shady real estate and old enemies. 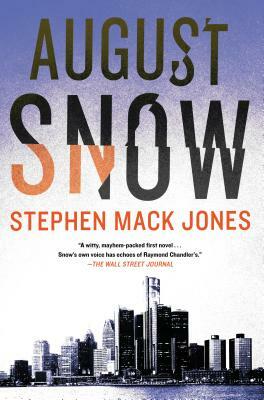 August Snow is a unique riff on the detective novel. We could talk about August himself for an hour. Join us Monday, March 18th, at 1pm on BookPeople’s third floor. The book is 10% off to those planning to attend. On December 17th, the Murder In The Afternoon Book Club will be celebrating the holidays during our discussion. We’re bringing snacks as well as our opinions this time. I’m planning on making my Golden Grahams s’mores. 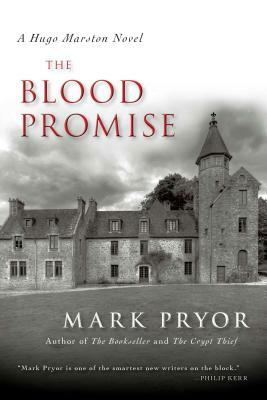 we will also be joined by Mark Pryor, author of Blood Promise, the book we will be discussing. Blood Promise is the third book to feature Hugo Marston, head of security for our embassy in Paris. He is assigned to protect a U.S. senator brokering a treaty at a country chateau. After some odd occurrences, the senator disappears. Hugo finds his search tied to an antique sailor’s box and a secret that goes as far back as The French Revolution. Come join us on BookPeople’s third floor, Monday, December 17th, at 1PM. You’ll meet some great people and a great writer. The book is 10% off for those planning to participate. C.M. Wendelboe is a western writer, no matter what genre he writes. A veteran of decades of law enforcement in Wyoming and the Dakotas his books show an understanding of the land and its people while delivering a well crafted and highly entertaining tale. In his latest to feature Arn Anderson, a retired Denver cop turned hired consultant for one of the city’s news stations, we have Arn also doing detail as as stock detective tracking down sheep rustlers. When he stumbles upon a murder he realizes “The Midnight Shepard” may have witnessed it. 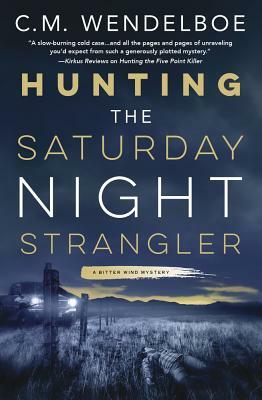 We talked to Mr. Wendelboe about Hunting the Saturday Night Strangler, how his writing is tied to his former profession, and the western life. MysteryPeople Scott: Part of the plot deals with the crime of sheep rustling. Is that more common than most people think? C.M. Wendelboe: Sheep rustling is still a common problem here in the west, as is cattle rustling. With sheep thefts, it is as I describe it in Hunting the Saturday Night Strangler where a trained dog can herd enough sheep to fill a small trailer (usually 25-30 head) and the rustler gone from the pasture within ten minutes. MPS: What did tying the two mysteries of the killer and the “Midnight Shepard” allow you to do? CMW: It allowed me to establish a continuity and a sense of purpose to Arn. Since he retired from the Denver Metro Detective Division, he has done what many retired lawmen have done after they hang up their shield—nothing except sit around watching soaps and drinking beer. Suddenly, the consulting gigs that Ana Maria snagged for Arn give him direction once again. He can use what has been his defining trait as an investigator—the ability to look at things from, first a broad perspective, and narrowing his thinking down into a laser-like focus to solve the cases. MPS: As in the first book, you occasionally have a chapter from the killer’s point of view. How difficult is that to do without tipping the reader off? CMW: I have wanted to use the killer’s perspective for some years now. When I was a law officer, I interviewed numerous genuine psychopaths and sociopaths, and each time I came away with the same perspective—they were highly intelligent killers whose intellect eventually were their downfall. To a man (and one woman) I talked with, each thought they were too clever—either because they were inherently intelligent—or that they were too ruthless to drop their guard. Those chapters were the most difficult in the book because I am unlike the killer, and because it would be so easy to slip up. Of course the last thing I wished to do—aside from the foreshadowing—was give the reader too much information where he or she could solve the identity of the murderer before I was ready to reveal it. MPS: One thing I like about Arn is that he is an older protagonist. What are some advantages in writing a hero with a few years on him? CMW: Arn is a lot like I was in my law enforcement career: the older I became, the more time I took to process things. This wasn’t due to a slowing of the mind, but rather an awareness that I missed many clues, many insights as I rushed headlong to find the answers. As an older character, Arn has grown out of the “puppy lawman” phase and thinks things through logically. Even though it takes him more time to do so. MPS: Like Craig Johnson, you mainly give a sense of place through its people. What did you want to get across about the citizens of Cheyenne? CMW: This series has a western flavor to it. Apart from Frontier Days (“The Daddy of ‘em All” rodeo), people here still live the western lifestyle even though most rarely set a horse or participate in brandings. But there are enough things in the community to point to the western heritage and makeup of the town, from the daily wagon and carriage rides seen on the streets in the summer to the lesser rodeos held nearly year-round to the abundance of large cattle and sheep herds within minutes from city center. A person can still see doors opened for others and women escorted away from curbside and men tipping their hats when introduced to strangers. But strangers not for long as the western hospitality will shine through. MPS: You also have a new western with Tucker Ashley. What can you tell us about that? CMW: I developed Tucker Ashley in the true sense of what folks think of the buffalo hunter/part time army scout/gunfighter. But I also wanted to showcase his abilities as a man tracker. Folks often assume that every frontiersman was track-savvy with the abilities to follow a gnat across choppy water. This was not so back in the day. Tales are full of men who misread sign and wound up lost or hundreds of miles off their presumed destination. Competent trackers back then were sought out, as they are today. MPS: You will be calling in to our Murder In The Afternoon Book Club on November 19th for your discussion of your first Bitter Wind Novel, Hunting The Five Point Killer. Is there anything we can’t ask? CMW: Sky’s the limit. Look forward to it. After Craig Johnson’s success with the Sheriff Walt Longmire series, the western mystery has had a renaissance. Investigations in rustic areas west of the Mississippi are proving to have an audience. One of the best newcomers in the field is C.M. Wendelbo. Our Murder in The Afternoon Book Club will be discussing the first book in his Bitter Wind series, Hunting The Five Point Killer. The book introduces us to Arn Anderson, who retired from the Denver Police under a cloud and now works as a consultant for one of the city’s news stations. When reporter Anna Maria Villareal works on a story involving three Cheyenne police detectives, Arn is dragged back to his home town. The investigation turns up old ghosts, as well as an old flame as the killer closes in on Anna Maria and him. 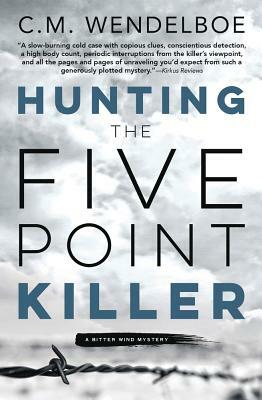 Hunting The Five Point Killer is a well crafted story that delivers everything you want in the sub-genre. It has humor, characters that pop, and mines the Cheyenne setting for great effect. It makes for a fun book to talk about and to make it more entertaining Mr. Wendelbo will be calling us to join in on the discussion. We will be meeting on BookPeople’s Third Floor, Monday November 19th, at 1PM. The book is 10% off for those planning to attend. For October, The Murder In The Afternoon book club will look at one of Scotland’s most notorious crimes through the pen of one it’s finest authors. 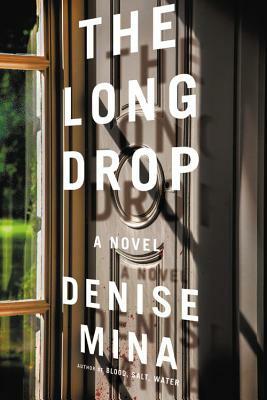 Denise Mina’s The Long Drop looks at The Beast Of Birkenshaw who murdered eight people around the Glasgow area in the late fifties. 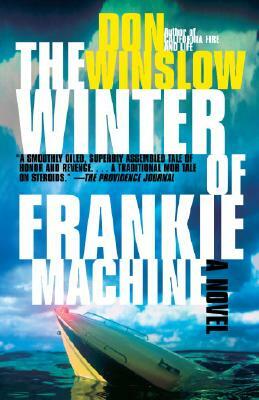 Mina takes the facts and blends a fiction that creates something more personal and even darker. Two of the killer’s victims were the wife and daughter of William Watt who was originally under suspicion. The book begins with a meeting Watt’s lawyer has arranged with Watt and Peter Manuel, a petty criminal who says he has knowledge of where the murder weapon is. He agrees to show Watt the evidence and tell him more, if they ditch the counselor. The two have a nightmare pub crawl that Mina weaves through Manuel’s trial for the murders. Mina uses both stories to examine moral and social aberrations, delving into media, class, and both sins of commission and omission. Everyone who has read this book has loved it and come away with their own interesting take. Share yours with us Monday, October 15th, at 1PM, on BookPeople’s third floor. The book is 10% off for those planning to attend.